A video has appeared online apparently showing a British photojournalist who was taken hostage in Syria by so-called Islamic State in 2012. The clip, said to have been filmed in the city of Mosul, in northern Iraq, is the first footage of John Cantlie to emerge in more than a year. 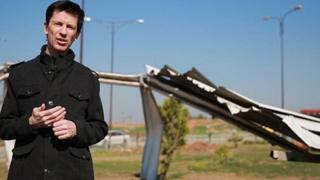 In the footage, Mr Cantlie ridicules US attempts to destroy IS. The Foreign Office said it was "looking at the contents of this latest propaganda video". Mr Cantlie was last seen in a similar video in Syria in February 2015. Like the latest film, it also had him addressing the camera as if he was presenting a television report. Mr Cantlie, who is originally from Hampshire, has seen his work appear in the Sunday Times, the Sun and the Sunday Telegraph. He was then kidnapped for a second time when he returned to the country towards the end of 2012. It is believed he was with US journalist James Foley, who was later killed. Last month, Mr Cantlie's supporters set up a petition on Parliament's website urging the government to ensure his safe release.